It makes sense that Joyelle McSweeney works in so many different modes–poetry, novels, short stories, theater, criticism–because her work is constantly crossing borders, upsetting categories, and insisting on its own singularity. 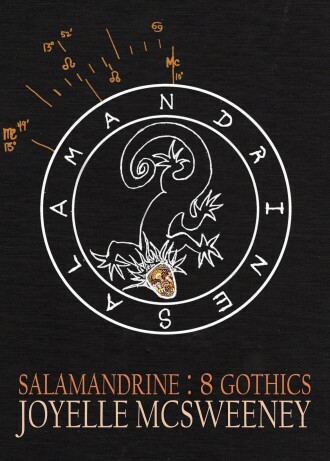 Her most recent book, Salamandrine: 8 Gothics, is a collection of playfully pitch black tales that center around crumbling worlds and mothers and daughters. The book concludes with “The Warm Mouth,” a fractured fairytale composed as a play for multiple voices. This coincides with McSweeney’s recent focus on theater. 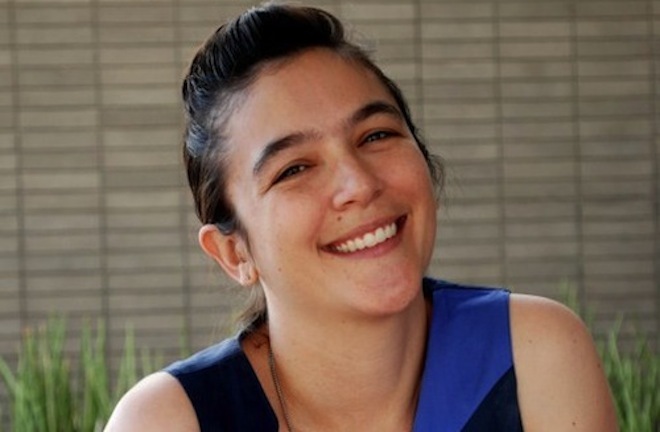 Her play Dead Youth, or, the Leaks was awarded the 2013 Leslie Scalapino Award for Innovative Women Playwrights and she’s currently working on an opera libretto based on the trial of Oscar Pistorius. Regardless of her mode at the moment, what’s consistent throughout Joyelle McSweeney’s work is how her words slip, skid, pop, and burrow throughout the page, creating a daisy chain of unexpected associations and indelible effects. Jeff Jackson: On Brad Listi’s Other People podcast, you talk about how you were a late bloomer in the dark arts. What spurred your aesthetic awakening? What were your own first steps and what convinced you to commit? But so far all this was an aesthetic preference for me and not something that was soaked into every inch of me like a rainwater into a Hot Topic t-shirt worn by a bedraggled teen walking on the shoulder of the Dragoon Highway in Mishawaka, Indiana! It actually took one of the so-called milestones of “maturity” for me come into my Gothness—and that was becoming a mother. Almost the instant I gave birth, I suddenly realized how fixed the game is. I realized that corporations were selling me products to supposedly protect my baby girl, and then recalling them (to no fanfare) just a few months later, admitting them to be carcinogens, flame-bearers, or choking hazards. I realized that the walls and the floors, the soil and the air were toxic, everything that could be seen or touched was poison, everything mankind did made the world worse, just moving around and breathing. It seemed to me that I had been walking in fire. Why had I not known it? Nutriment and poison, protection and hazard, comfort and harm were not binaries but indivisible, each one turning over to reveal its attractively hairy reverse or iridisceing, spiny obverse. All binaries collapsed for me. An agony of trance. Yet I suddenly understood what I had been training for in my earlier years as a baby decadent. I suddenly understood that Art as the one material on earth that is bio-identical to Death. I call it death-in-life or life-in-death. Or as Poe wrote: Lygeia! And I must say it’s been a great relief to put aside those American/humanist myths of health, wealth, futurity, stability, success, progress, and perfection in favor of these absolute values of Crime, Death, and Art. JJ: Where do see these values playing out in the most interesting and powerful ways right now? Visual art, film, literature, music–or other places? JM: Hacking and leaks provide one of the most interesting arenas of subterranean action and writing that literally takes place below the corporate interfaces (i.e. screens) most of us encounter as reality, but then burst forth into conventional space as leaks, media events, scandals and spectacles. I guess this is a surreal political model as well—that which is below bursts forth to scandalize the ether. Hackers and leakers who come to light are usually construed by the media as aberrant and/or mentally ill and/or evil—Chelsea Manning, Julian Assange, Edward Snowden—narcissistic, maudlin, paranoid, insane, of unconventional gender—all the attributes of an artist! So for me there is a strange upwelling of goth/decadent/aestheticist alterity to this hacking/leaking phenomena where it hits the above ground, manifest media space. Of course this hacking/leaking is generally marked as a male activity and this underground is riven with volatile, often violent sexual dynamics, so that makes it a space of shame as well, of veniality and obsession, a space where performances of enlightened personhood fall short. I’m interested in that as well, this vulnerability, humiliation, and shame coming (aberrantly) into visibility. Like Peter Lorre in M. The obscene is that which should not come to light, but does. The notion of the obscene links both the personal “failings” and the content of the political “leakings” these figures are associated with. JJ: A number of the stories in Salamandrine revolve around mothers, especially what many would consider bad mothers. Is motherhood a character trait or is it an occult force animating these pieces? JM: Definitely closer to the latter. For me, becoming a mother was like, when you’re watching a horror movie and the heroine is about to open the door and you’re like, “Don’t open that door!” and she opens the door—that’s what motherhood has been like. I opened the door and now I’m in another dimension of surreal horror. This book is in some ways 8 different takes on that kind of horror—motherhood as this mode in which you are right up against Death, all the time. An infant as a seven-pound interface with Death—a portal which grows larger all the time! The feelings of fear, horror, dark humor, helplessness, and frightening power I have felt as a mother are all modes in this book. JJ: Talking about Salamandrine, you mentioned to me that tortured prose seemed appropriate for an age of torture. Is there a politics of prose for you? Are there certain styles or structures that feel more effective for doing your work? Or is your writing animated by other concerns? JM: I write prose the same way I write poetry or anything—I feel pulled into a zone of not knowing, and I try to sing back to that invitation or pull. Maybe my singing is out of phase with the initial invitation, and so they create dissonances, amplifications and weird accidental harmonies. My writing is very sonically driven, it happens not entirely inside rationality, and I try to keep building towards that peak/declivity where the irrational splits apart from the rational and moves the writing outside of the paraphrasable or knowable. I don’t think writing should build any kind of boundary wall, I don’t think writing should wall out the terrible urges and urgencies that have the world skidding on its anthropogenic decline. I believe in a bloody grin and a look of dismay. I believe in influence, especially bad influences. I’m defenseless. I’m against humanism and its graveyard-whistling, though I like both graveyards and whistling. Meet me at the cemetery gates. You know how to whistle, don’t you? JJ: Graveyard whistling seems like an appropriate segue into talking about literary canons. Is the idea of a canon–whether a private one of your own devising or otherwise–in any way useful or inspiring to you as a writer? JM: Building a personal canon has been crucial for me. Thinking about my “heroes,” placing them in occult, anachronistic conversation with each other, and then carrying the charge from their work into my own is vital to my practice. The more risks I take in my work, with its language, genre, and content, the more I feel I need to have this ghost chorus of artists circled around me. The ones who go all the way. The sweet delight/endless night crowd. The actual roster might vary based on my moods and the weather, but on that list right now are: Aristophanes, Kim Hyesoon, Marosa Di Giorgio, Aime Cesaire, Cesar Aira, Amiri Baraka, Poe, YiSang, Ronaldo Wilson’s Tear-E-Avatar, Jack Smith, Yoko Tawada, Ana Mendieta, Blake, all the early Modernist Futurists, Lars Von Trier, Baudelaire, Rimbaud, Genet, Claire Denis, Wole Soyinka. Because I’m writing my play Pistorius Rex right now, I’m kind of on a Greek trip. Medea and Philoctetes are two of the strangest things I have ever read. Oh, and also Joy Division. JJ: What initially led you to writing plays? Was there a particular influence? And where has playwriting been taking you lately? JM: When I was a kid we lived for three years in Austin Texas. I acted in a repertory production of a Christopher Durang play that ran for a few seasons, playing a little boy. I would go at night and work with adult actors for an adult audience—in retrospect I am incredibly grateful to my parents for allowing me to pitch headlong into Art like that. Just being out at night! Plus pinning up my braids, wearing a wig and handling a gun! That’s Art! Another wild leap of faith my parents took was my high school graduation present of going to see Angels in America on Broadway (this was 1994 and we had moved to Philly), parts one and two in one day. The massive spectacle of it all! The exhilaration and exuberance and anger that seemed to sublimely rocket forth from holes AIDS (and the craven government and cultural response to AIDS) carved into the culture and the physical bodies of its victims! The play’s relentless breadth allowed you to sense this double feeling of overflowing and hollowing out, this weird paradoxical difference engine made from opposites. I go for that feeling in my plays, fling myself towards it. In all the plays I’ve written tragedy and farce work both in and out of sync with each other forming a kind of eruption. JJ: How was the experience of seeing your play Dead Youth, or, the Leaks performed? Did you work with the director and actors beforehand or offer any guidance? Are there plans for more performances? JM: This production was incredible. Fiona Templeton and I did not really correspond beforehand. Instead, she read the script and with her visionary insight seemed to grasp just how to move it from a page-bound text to something aurally dimensional. That was such an amazing gift to me, that she thought my play was worth her attention. At the same time, I was absolutely blown away by the actors’ commitment to a script they had received just days before. They tore into what was very ornate and riddling and allusory and goofy and dirty language and had fun with it. They didn’t complain that it was too difficult, opaque, or alienating, or any of the things critics (or other poets) say about poetry that has a lot of linguistic joy or flair. Instead they just kind of put it on and paraded around happily and deftly. The intelligence, bravery, and vocal skill of these actors was incredible. I’ve noticed this also when my play The Contagious Knives received a staged reading at the Medicine Show Theatre under the crack direction of Barbara Vann, last Spring. For both these troupes and under both these women’s direction, my language became outrageous costumes the characters wear around, to flaunt and Chevy in, go glittery and bladed and bare in unexpected places. I dearly hope I will have the pleasure of hearing other groups of actors perform these plays. In the meantime, I’ll travel around with my snake oil and read ‘em myself!